Flower arrangements frequently use leaves, plants and flowers that have been modified to enhance the finished appearance of the arrangement. Painting leaves to use in flower arrangements is a process that requires several steps. First the leaf needs to be dried and then stabilized before acrylic paints can be used to modify the color and appearance of the leaf. Then the leaf needs to be finished to make the texture or finish more uniform. The results can be quite unique and interesting. Fill a disposable aluminum cake pan with white sand. Place the cake pan in a 300 degree oven for 10 minutes. Remove the cake pan from the oven using oven mitts. Scoop sand to the side and place your leaves so that you can fully cover them with hot sand. Remove the leaves after the pan (and sand) has become cool to the touch. Pour varnish into a disposable cake pan (a new one) so that the varnish is 1/4-inch deep. Lift the leaves out of the sand and clean both sides off using a soft 1-inch artist brush. Iron the leaves flat using an iron. Be careful not to burn them. Spread aluminum foil on your work bench and place a cookie rack over the foil. 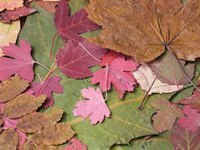 Dip your flattened leaves into the varnish so both sides of the leaf are coated. Place each leaf on the cookie rack to dry completely. Most varnish products will dry overnight. Paint your leaves using acrylic paint and a 1/4-inch artist paint brush. Popular techniques include edging leaves in metallic colors, creating color wash effects by thinning your acrylic paints as you apply color and blotting at drying paint to create mottled effects. Allow your acrylic paints at least 4 hours to dry. Spray your finished painted leaves with a clear coat finish that is compatible with both your acrylic and varnish products.